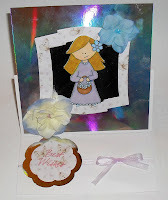 Here is the card that my daughter made. It is her first attempt at an easel card and I for one think she has done fantastically well. 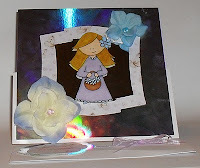 She used a 6 x 6 card, with a silver mat and a butterfly background from the crafter's companion Flower Fairies CD. The image was a free digi stamp but I can't remember where I got it from. Padme has used Copic markers which I purchased from Craft Den.